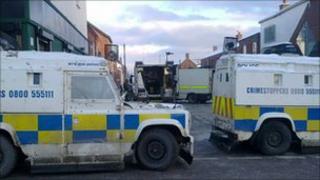 A security alert which saw up to 50 homes evacuated after a suspicious device was found in north Belfast has ended. Army bomb experts carried out a controlled explosion on the device in Stratheden Street and the street has now been re-opened. A PSNI spokesperson said it was a "crude but viable" device. A mother and her two young sons, aged seven and four, were home when the device was discovered after 0700 GMT. They are described as being shocked, but not injured. The woman said she had no idea why her home was targeted. During the evacuation, elderly residents were helped from their homes by relatives and police. Some people went to a local community hall which had been opened to take those who had nowhere else to go. North Belfast Sinn Fein MLA Caral Ni Chuilin said that whoever was behind the incident needed to "seriously consider their actions". "They have placed local residents at risk, and two days before Christmas in sub-zero temperatures have forced 50 families to leave their homes," she said. "I am calling on whoever is responsible for this to come forward and explain the ridiculous rationale behind what they have done to this community. Further to this they need to bring these futile actions to an end."